Ioan Dzitac received his B.Sc.(eq.M.Sc.) 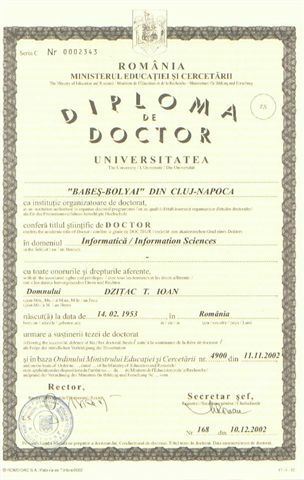 in Mathematics (1977) and Ph.D. in Information Sciences (2002) from Babes-Bolyai University of Cluj - Napoca. In 2019 he has defended his Habilitation Thesis "Soft computing for decision making" at Älexandru Ioan Cuza"University of Iasi. He is a mathematics and information sciences professor at Agora University of Oradea (since 2017) and at Aurel Vlaicu University of Arad (since 2009). He was Rector of Agora University of Oradea in period 2012-2016 and was re-elected for a new mandate (2016-2020). He was an Adjunct Professor at University of Chinese Academy of Sciences - Beijing, China (2013-2016) and since 2016 is an Advisory Board Member at Graduate School of Management of Technology, Hoseo University, South Korea. He was in managerial positions, such as: Director of Math & Informatics Department (2004-2005), Head of IT Chair (2005-2008), Director of R&D Center (2009-2017), and Rector (2012-2016). His current research interests include different aspects of artificial intelligence, soft computing and applications of fuzzy logic in technology and economy. He is co-founder and an Editor-in-Chief of an ISI SCI Expanded quoted journal (2006), International Journal of Computers Communications & Control (nominee by Elsevier for Journal Excellence Award -Scopus Awards Romania 2015) and member in Editorial Board of 10 scientific journals. Also he is co-founder and General Chair of International Conference on Computers Communications and Control and he was member of the Program Committee of more than 70 international conferences. He is a Senior Member of IEEE (since 2011) and other professional organizations (ROMAI, SRAIT, SSMAR, RNG-ISCB etc.). . He was an invited speaker and/or invited special sessions’ organizer and chair in China (2013: Beijing, Suzhou and Chengdu, 2015: Dalian, 2016: Beijing), India (2014: Madurai, 2017: Delhi), Russia (2014: Moscow), Brazil (2015: Rio), Lithuania (2015: Druskininkai), South Korea (2016: Asan), USA (2018: Nebraska). He has published 3 books, 12 courses and materials for students, 6 conference proceedings and more than 80 scientific papers in journals and conferences proceedings (over 40 in ISI Web of Science indexed journals with over 180 citations). Teaching subjects at Agora University (by March 2017): Mathematics, Information systems in decision making. Editor-in-Chief of International Journal of Computers Communications & Control edited by Agora University (IF=1.374). Agora University of Oradea is a higher education institution of private law and public utility, founded in 2000 by Agora Foundation, accredited by ARACIS in 2010 and validated by the Romanian Parliament by Law 59/2012, as a part of national system of higher education in Romania. On 24.04.2012 I was elected rector by all teachers and students of the University Agora, the legislature from 2012 to 2016, and in 2016 I was re-elected for the mandate 2016-2020. 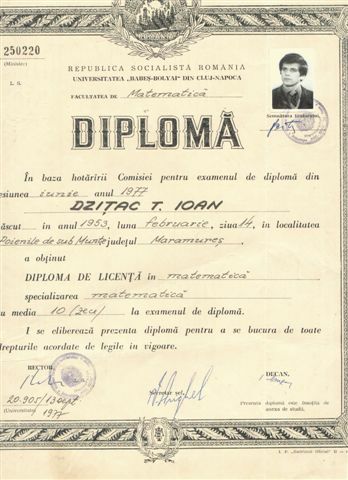 Rector legally represents the University Agora of Oradea (UAO) in the National Council of Rectors in relations with the Ministry of National Education and its subordinate entities or advisory (ARACIS, CNATDCU, UEFISCDI etc. ), with central and local government, educational institutions and national research and abroad, with domestic and international public bodies. Although young and small, with two faculties (Faculty of Economics and Faculty of Law and Administration), University Agora is extremely dynamic and active. Instead of a quantitative prefer qualitative development. Without false modesty, Agora University have some performance difficult to achieve even some old and larger academic institutions: 5 research centers (two international), a publishing house editing 5 international scientific journals in English language (one of which is indexed in ISI Web of Science), 5 international conferences in English, a computer laboratory, a forensic laboratory, three rooms with smart boards for videoconferencing courses, three lecture halls with over 100 seats, platform for e- functional learning, and 10 POS-DRU successfully projects. If you agree a higher quality education, through modern teaching technologies, in full transparency and legality, come with the greatest confidence to University Agora.